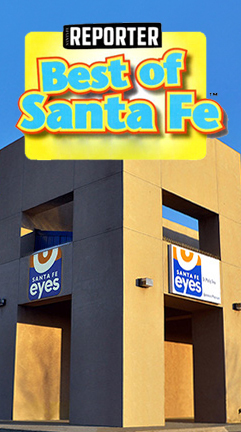 We are glad you have chosen Santa Fe Eyes as your eye care provider. The professionals at our office provide each patient with quality vision solutions and exceptional customer service. Our certified staff is experienced in all areas of vision care for patients of all ages. We offer the largest selection of designer eyewear in the Santa Fe area. Our office is Bilingual in English and Spanish. Dr. Treu is an Optometrist in Santa Fe providing complete eye care services for the surrounding communities. Dr. Philip Treu is a graduate of the University of Missouri - School of Optometry in St. Louis. He served as Director of Optometric Services and practiced primary care medical optometry in a large private practice in St Louis for nearly 15 years. "I have been extremely fortunate to have Dr. Treu as my eye doctor. I have severe vision difficulties. My two eyes don't work together correctly, and I have an incredibly small window of tolerance. If my prescription is off by just a small amount, I am in extreme discomfort. Dr. Treu has worked with me over several visits during the year to maximize my vision. He really knows his craft! I've recommended him to a number of friends and colleagues..."